On the 15th of June of 2011, a large protest was organised by the popular assemblies of 15M Barcelona, born during the occupation of Plaza de Catalunya, to peacefully “block” the proceedings of the the Parliament of Catalonia, and so disturb or impede the vote on a new austerity budget by the neoliberal government of Artur Mas. The “crimes” committed by these individuals: painting the coat of an ex-counselor of the region’s ministry of the interior, displaying a protest banner, shouting slogans to passing parliamentarians, calling out that “they do not represent us”, all contributing to an “environment of intimidation”. There crime in other words was to have challenged the State, its legitimacy and authority. As for violence, there was none, except on the part of the hundreds of heavily armed riot police and the clandestine police provocateurs (clearly identified in photographs and videos of the event). Yet it was not they who were convicted, nor the politicians whose policies of confiscating and privatising public wealth has caused so much hardship to thousands. The move to block the parliament may be criticised for having placed State institutions again at the centre of political contestation, when 15M seemed to have resolutely opened up the possibility of non-State politics. And the response of the Catalan authorities was quick and predictable; a response that would include a general effort to repress the movement. And yet on that day of 2011, the line which separates governed and governors briefly fell away; the governors like naked kings stood unmasked. And all that remained of the State was the police. Order had to be reestablished, and with urgency; through violence if necessary, the violence of physical repression, harassment, fining and incarceration … in sum, a politics of fear. In parallel, in Catalonia at least, the government played the nationalist card with a vengeance: the maneuver consisted of constructing a political unity around the “Catalan people” through the marginalisation, expulsion, of the enemy from within, identified as “anti-system”. The eight today convicted are among the many who have payed the price for dissidence and rebellion. The 15th of May movement, for all of its weaknesses, inaugurated a wave of social protest in spain, and perhaps in europe, unseen since the 1960s-70s. What the spanish State is thus engaged in, through the conviction of these eight individuals, and others, through the persecution of anarchist activists in the operations Pandora and Piñata, through penal code reforms and the new law of citizen security, is the destruction of all that 15M awakened. But as those who seek to break a piñata do so blindfolded, so too the State may be blind, for where there is repression, there is resistance. 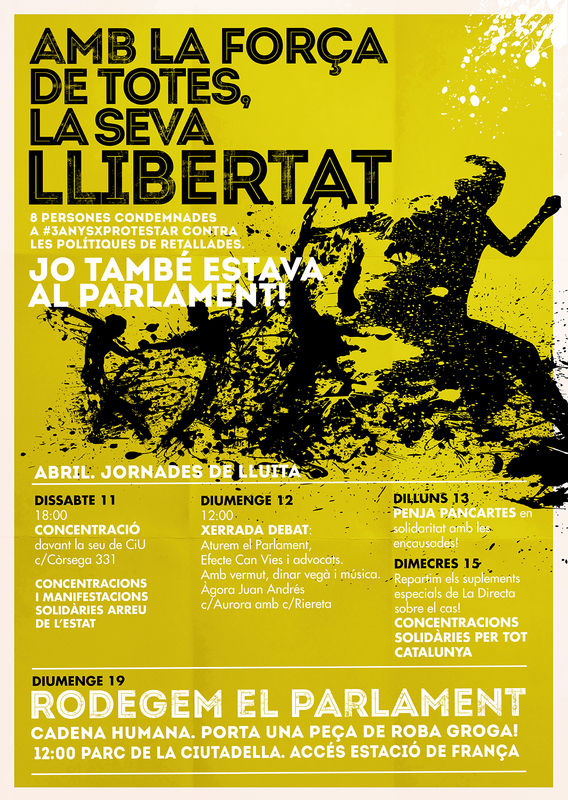 Protests have called for all of next week, throughout spain, with a surrounding of the Catalan Parliament on the 19th of April. Operation Piñata: We are all enemies! In 1985, the conservative jurist Günther Jakobs congratulated himself before the world for the apparition and development of a restrictive legislation in obvious contradiction with traditional penal law, in which a strange entity appeared which he called enemy penal law. Such laws sanctioned behaviour of which the “competent authorities” attributed the role of leading to the commission of illegal acts even though said acts had not been committed. The supposed offender would suffer punishment not for acts realised, but for possible acts. The law no longer conceives of her/him as a citizen of the State with full rights, but rather as a danger, an enemy of the State with limited rights, or better, with none. Given then the instability of some political systems where the progression of social injustice testifies to their historical failure, legislation against the “enemy” has moved from the exceptional to becoming the norm, breaking the logical relation between offense and sanction, crime and punishment. In the current juridical order, the arbitrary detentions and registrations of identity without express orders, the gratuitous violence of agents of the police, the deficient procedural guarantees and disproportionate punishments for non-existent crimes, come to be normal. We have seen this recently, for example, in the 4F trial, in the trials of strike picketers, in Operation Pandora, in the revision of the sentence of those who “blocked” access to the Parliament of Catalonia, things which confirm a situation which no longer corresponds to a State of Law, but to a State of Exception, or, to a State of No Law. Politicians, police, judges, prosecutors and magistrates joyfully contribute to it. An authoritarian system, calling itself democratic or not, defines itself with respect to its enemy, this vile and base being whose abolition it pretends, and to which in our times the label of “terrorist” applies to perfection. However to qualify every enemy as a terrorist requires a great flexibility in the concept. In the fuzzy field of terrorism then, all things may be included, from the burning of garbage containers and the lighting of flares, to acts of armed struggle, from the diffusion of ideas, to okupations, to suicide bombers. In the concept, anyone who disagrees with the state form as the ideal of a freely organised society and who doubts capitalist economic development as the essence of democracy, is caught; however little her/his ideas are put into practice, in the language of order, this would be equivalent to “subverting the constitutional order, or suppressing, or gravely destabilising, the functioning of political institutions.” The crime of opinion, that is, having an opinion contrary to dominant opinion, seems to go very far. Equally encompassed, the crimes of usurpation and resistance to public authority, that is, the creation of social centres in abandoned buildings and protests against police brutality. The imaginary plots of “anarchist terrorism” discovered by the police and pursued by judges, is a clear demonstration of what we are hear speaking of. Operation Piñata of the 30th and 31st of March last, second part of Operation Pandora, had as its object the detention of persons accused of belonging to a “criminal organisation with terrorist goals”. Let us understand this matter of “goals”, given that there is no proof of any kind that the detained were organised, nor actions which even using the most ample criteria for defining terrorist acts could be applied to them. 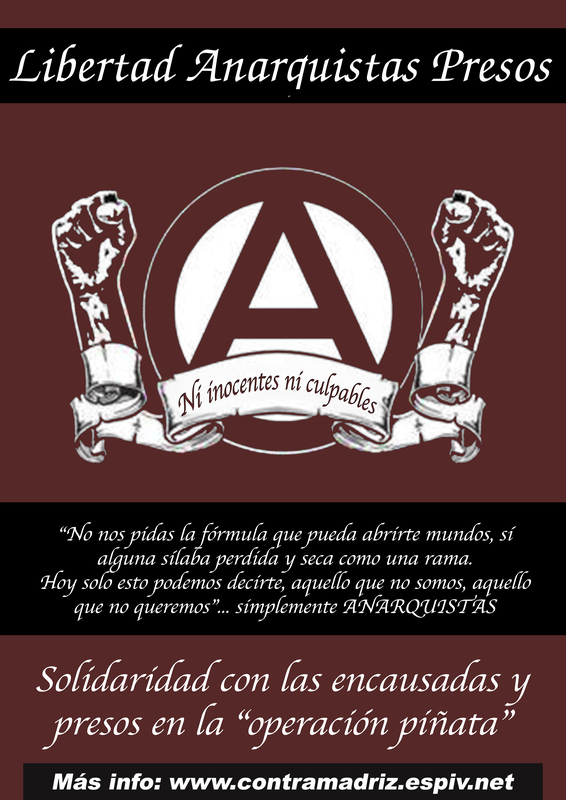 The organisation that was referred to, and which many had nothing to do with, the Grupos Anarquistas Coordinados, has been nothing more than a forum for relations between individuals and collectives of shared ideology with perfectly transparent practices of propaganda, with an electronic address included. Nevertheless, in enemy penal law, the organisation of opposition is by nature an offense, and consequently, criminal and terrorist per se; a “place of encounter for violent groups” disposed to commit improbable “sabotage and the setting of explosive devices” with the objective of “sowing terror in the population”. Here what is judged is solely the intention, which is taken as proven. The enemy has no right to intimacy, nor to the freedom of expression or assembly, such that the use of the server Riseup, as the publication of a book and the coordination of persons, are considered sufficient proof of potential crimes or of responsibility for crimes committed by unknown others, like the letting off of firecrackers in bank machines or the placing of explosives without detonating devices in the Church of Almudena y del Pilar, in Saragossa 2013, which serve to qualify as “terrorists” the victims of this Operation. The Director General of the National Police Ignacio Cusidó has no hesitation in affirming publicly that “anarchist terrorism has implanted itself in Spain” and that for this reason, the struggle against it is “a police priority”. If the facts belie such proposals, so much the worse for the facts. The agents of order will arrange the proofs and the judges will ignore favourable testimonies. The enemy penal code submerges us in a Kafkaesque universe which in its own way possesses a certain logic, the logic of fear. The jihadist aberration and the prolonged crisis threaten to awaken a security hysteria among the masses of citizens that augurs nothing good. Bad times for freedom, and good times for the hawks of politics. Fear is the alibi of power, and a part of it wishes to play this card to the full. The noise of those who take to the streets has ridiculed numerous times the efficacy of forces of order who identify excessively with their repressive function, and yet who are incapable of neutralising riotous urban struggle that is very modest in numbers. What is ridiculous is often much more subversive than radical propaganda or stone throwing; if it is not the most radical act of sabotage of the system, it is that which most delegitimises it. Operation Piñata was not unleashed against an ethereal anarchist terrorism, but rather forms part of a war plan that points to the segregated surroundings of the system that lie at the bases of social dissidence and public-street resistance: cultural associations, okupied centres, neighbourhood assemblies, autonomous workers collectives, anti-prison groups, territorial defence groups … . It is a cleansing operation that seeks to avoid certain miniscule points of support, in the heat of the economic and political crisis, converting themselves into a lever for a social crisis that will be far more difficult to manage. As Cusidó stated, it is a “preventative labour”, two words that should be interpreted in their military sense, given that this servant of the State is conscious of being at war against the radical band of social justice, equality and freedom. IMMEDIATE FREEDOM FOR THE DETAINED! This entry was posted in Commentary, News blog and tagged 15M, anarchism, spain. Bookmark the permalink.